Just 100 miles south of mainland Britain and only 14 miles from the coast of France, the most southerly of the Channel Islands has one of the best sunshine records in the British Isles. 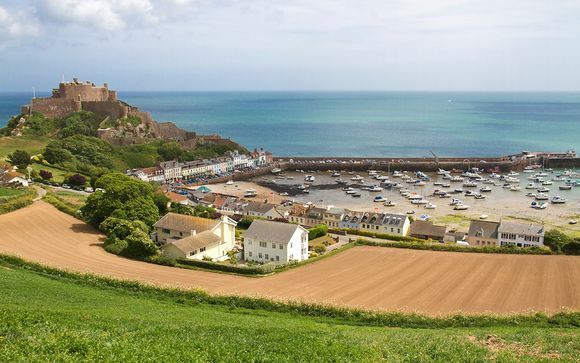 A compact island of only 45 square miles, Jersey has over 350 miles of roads and country lanes with over 20 beaches and coves to explore and spectacular scenery which takes you from sweeping bays in the south to dramatic cliffs in the north. Within this compact island there are so many things to see and do. For many, the greatest attraction is the coastline, and nowhere in Jersey is more than two miles from the sea. Don’t neglect inland, though, where you can find pretty countryside, old stone farmhouses and beautiful flowers. The streets of St Helier, Jersey’s capital, hold a host of hidden delights. It has sophisticated shops, varied nightlife and a mouth-watering selection of restaurants, whilst the pace of life is leisurely and guaranteed to put you in holiday mode. 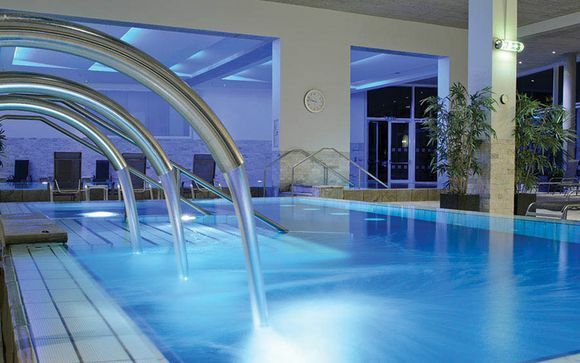 Hotel De France & Spa sits in an elevated position with excellent views of St Helier and St Aubin's Bay, and is home to award winning restaurants and a stunning spa. Perfect for a romantic break, a rejuvenating wellness retreat or a weekend spa trip with friends, Hotel De France is a health conscious, yet luxurious and welcoming destination, and the slower pace of life and mild climate in Jersey will relax you even more. All guests can enjoy complimentary use of the extensive facilities at Ayush Wellness Spa, including an infinity swimming pool, massage pool, hot and cold plunge pools, sauna and steam rooms, yoga studio and multi-purpose gym. Comfortably furnished to offer comfort, and a calming atmosphere that reflects the hotel's feel. 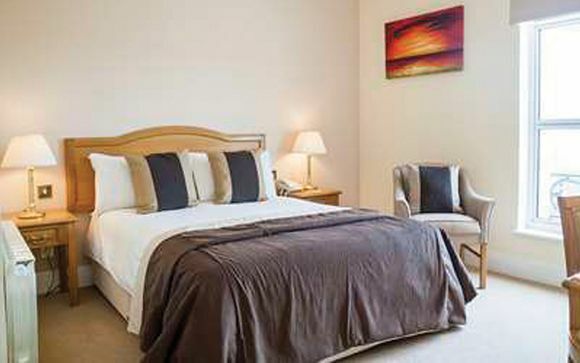 Includes: en-suite bathrooms, radio, sky television, direct dial phone, tea and coffee making facilities, in-room safe, hairdryer and free wireless internet. This offer is based on a bed and breakfast stay. Just for you: Complimentary 2 course dinner on first evening at Café Aroma. This relaxed eatery offers a selection of refreshments, sandwiches, salads, light bites as well as traditional pub classics and all day cooked breakfast from early morning to late evening with the addition of an evening specials menu from 6.30pm. According to the traditional wisdom of Indian teachings, Indian spices all have specific healthy benefits, and it is with this 'wellness ethos' that the chefs create delicious, healthy and flavourful Indian fusion cuisine. Encompassing the finest Indian traditional dishes, whilst adopting Modern European cooking techniques including molecular cuisine, the results are outstanding. Cookery Classes and Wine Tasting demonstrations can be arranged for small groups on request. Offering a combination of authentic Ayurvedic therapies and luxurious spa treatments, this beautiful spa promises to rebalance your body through natural therapies, yoga and meditation. Every detail of the Ayush Wellness Spa facility has been created with nature in mind; beautiful stone and wood combine with open glass walkways to maintain the vast spacious air element. Although open and spacious, only six private treatment suites, a relaxation lounge, yoga studio and library inhabit the space, ensuring your time here is a quiet, reflective experience. An exclusive boutique styled private members health and fitness club for the discerning health-conscious individual. The club has been uniquely designed to combine luxurious interior design with impeccable attention to detail to create a non-intimidating home from home feel. Enjoy a high tech workout, then cool down with a smoothie, or head to the spa to recover. Please note you cannot be guaranteed a specific make of car within a certain group. The minimum age for driving a hire car in Jersey is 21 and drivers must have held a full driving licence for a least 1 year.